Denis Corry, Phillip Brennan, and Daniel Vaughan, former Tulla hurling goalies, at the unveiling of a stone commemorating Dr Tommy Daly. Photograph by John Kelly. 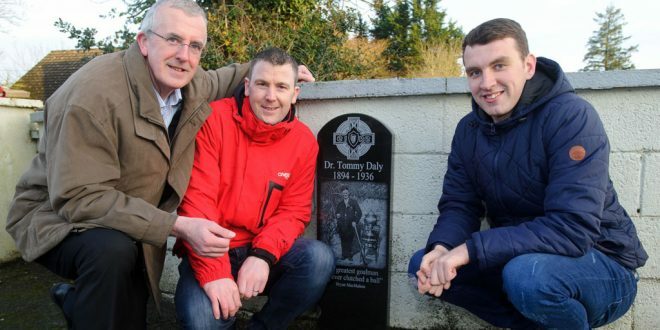 THE 80th anniversary of the death of the legendary Dr Tommy Daly from Tulla was recalled last weekend, when a memorial was unveiled in Tuamgraney at the spot where he was tragically killed in 1936. According to the inquest, he died following a single vehicle collision, after he swerved to avoid a cyclist on the road between Tuamgraney and Scariff. Harry O’Meara, the winner of two senior championship medals with Scariff, came on the scene of the accident. He was 10 years of age at the time and he was present on Saturday when the unveiling took place. Speaking at the unveiling, Denis Corry (Tulla), who wrote a detailed article on the great goalkeeper for the Tulla GAA history book, The Claret and Gold, recalled the achievements of the man after whom the GAA park in Tulla is named. An All-Ireland junior medal winner with Clare in 1914, Dr Daly won three championships with Collegians in Dublin and six Fitzgibbon Cup medals with UCD, after moving there to study medicine. Due to the non -residents rule that was in place at the time, he could not play with his native county, so he lined out with Dublin, with whom he won four All-Irelands. He was one of five Clare men on the Dublin team that won in 1927 and he was on the Leinster team that won the inaugural Railway Cup in 1927. He played for Ireland against the USA in the Tailteann Games in 1928. He returned to Clare in 1930 and helped the county to win the Munster senior championship in 1932, having made his debut for Clare at the age of 36. He played for Munster in 1933 but didn’t win a Railway Cup with them. However, he helped Tulla to win the Clare senior title in 1933. He was again part of the Tulla team in 1934. They played Clonlara in a cup match when an issue arose over the status of a Clonlara player, who also played hockey. A complaint was lodged but it was thrown out and Tulla refused to play any game. Dr Daly was also a noted referee and he took charge of the 1935 All-Ireland final between Kilkenny and Limerick. Clare County Board GAA chairman, Joe Cooney, also spoke at the unveiling. He described Dr Daly as “a remarkable man who was a major loss to his native county, when the non -residents rule prevented him from playing for Clare when he was studying medicine in UCD. It’s a mark of the respect in which he was held that the playing field in Tulla was dedicated to his memory”. 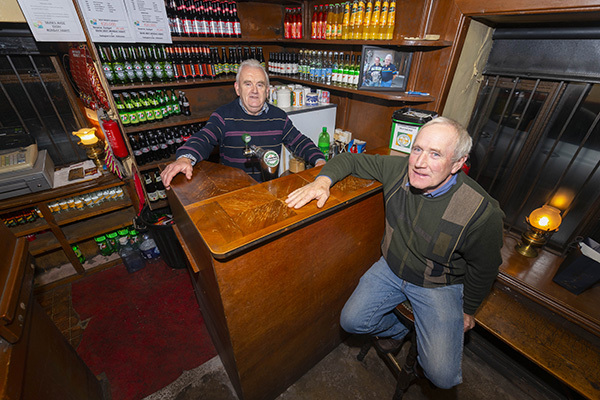 Cooney, from nearby O’Callaghan’s Mills, in recalling Dr Daly’s achievements, noted his contribution to refereeing and highlighted the fact that in addition to being in charge of an All-Ireland final, he also refereed a Cork county final. Ed Jenning, chairman of Tulla GAA Club, was another to address the gathering, which was also attended by local great, Pat Danagher. Three Tulla hurlers who have all played in goals for Clare were also present at Saturday’s unveiling, Denis Corry, Philip Brennan and current U-21 net-minder, Daniel Vaughan.